Did you know there are people who pretend to be real financial advisors? However, they are really sales representatives. They make this false claim to reduce sales resistance so it is easier to sell investment products to unsuspecting people. Reps and their employers know 90% of people do not want sales representatives investing their assets. Investors have three concerns. The competence of the reps. Do they have the knowledge investors need to achieve their financial goals? Their ethics. Do they recommend the best products or the products that pay the biggest commissions? Their ongoing services. Reps are paid one-time commissions to sell products. They are not paid ongoing compensation to provide ongoing services such as performance reporting. Reps have to get over these three hurdles. The easiest way is to lie about their actual role. Yes it is for two reasons. One is reps can use whatever titles help them sell the most investment products. Many reps call themselves financial planners, financial advisors, and investment advisors. This benefits the rep and the company behind the rep because they sell more products. Also, reps do not have mandatory disclosure requirements that require them to volunteer factual information. It is up to investors to ask the right questions, visit the FINRA website, and know good answers from bad ones. Or, they can use Paladin research tools to do the work for them (www.PaladinRegistry.com). Who are the Real Financial Advisors? Real financial advisors have three key characteristics. Their registrations. They are Registered Investment Advisors (RIAs) or Investment Advisor Representatives (IARs). Their method of compensation. They are paid fees like other professionals who are depended on for specialized knowledge and services (CPAs, attorneys). 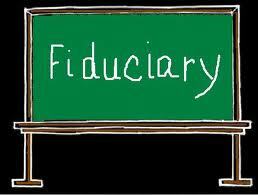 The dictionary says a fiduciary is a person who holds a position of trust. An investment advisor is a super-fiduciary because he provides advice people depend on to make investment decisions for their assets. This is a major position of trust, in particular when retirement assets are at stake. However, not everyone in the financial service industry is a fiduciary. RIAs and IARS are fiduciaries. Sales reps, stockbrokers, and insurance agents are not fiduciaries. Why Select a Financial Fiduciary? RIAs and IARs are financial fiduciaries who are held to the highest ethical standards in the financial service industry. Your financial interests must come first. Reps, brokers, and agents are held too much lower standards that are deliberately vague so reps and companies make their own decisions about what is ethical and unethical. How else could Goldman Sachs sell toxic mortgages to unsuspecting investors? Why are Ethical Standards Important? Ethics are supposed to protect you from unethical business practices. But, they do not do a very good job when ethics are vague and subject to interpretation. For example, is it ethical for an advisor to sell a bad product that produces a big commission? The higher fiduciary standard says no – that is not in the investor’s best interest. A lower standard says yes – it is the investors’ responsibility to know the product is low quality and the rep has a conflict of interest due to the size of the commission. Select advisors who are RIAs or IARs, are acknowledged fiduciaries, and are compensated with fees like other professionals. You can find them on your own or use the free service on www.paladinregistry.com. 100% of the advisors who are profiled on this site are RIAs, IARs, fiduciaries, and compensated with fees.